This blog is dedicated to my friend, my mentor, and the best teacher I have ever had. Without him, I would not have embarked on this amazing journey. Split, this blog is for you! 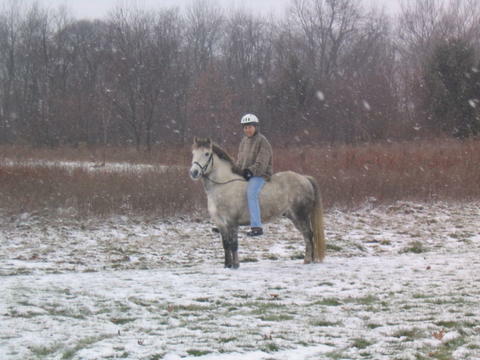 Ponderosa Misty Icon, aka "Split," is a handsome gray Welsh pony who came to me via a phone call "out of the blue" (actually Peterborough, Ontario). 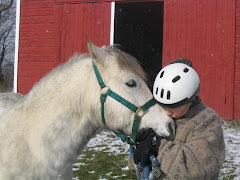 Our first few months together were rocky to say the least, which made me question my ability as a horse owner, as a horsewoman, and as a rider. 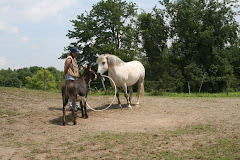 Forty years of horse ownership had not prepared me for this little gray pony! But we muddled through and because of Split, I have begun a journey that is both spiritual and enlightening. I hope something here resonates with you and that you'll check back now and then. We leave you with one of our favorite quotes: "The best whisper is a click!" This little feller has been frequenting my bird feeder. He's awfully cute and I actually enjoy his antics on the front porch. My husband has offered to shoot him with his Red Ryder BB gun but I don't want anyone shooting their eye out. So for now, Squirrel and his nuts are safe at my house! The idea is that there is a kind of memory in nature. Each kind of thing has a collective memory. So, take a squirrel living in New York now. That squirrel is being influenced by all past squirrels. 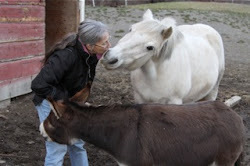 Peggy Hogan @ "The best whisper is a click"
Aren't you going to get on the other end? Click me, Mom! I did it! 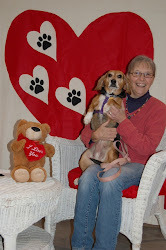 Best Beagle In The Class!!!! !